Within our vast, boundless mind is a tremendous amount of empty space. Space for recollections, tasks, dreams and involuntary motor functions. Our everyday thought processes rent just a small percentage of this available space. Within this space is facilities like the ego which harbors our fears and anxiety; visions of the future and memories of the past. Surprisingly, this makes up much of our thought trails on a daily basis. As humans born and continually inundated in western culture, we tend to unknowingly attach our identity to this ego which tends to drive most of our thought processes. Through societal conditioning our identity becomes defined by our most intimate uncertainties, challenges and struggles. We are stamped out of a mold, labeled and categorized. We are closed off and claustrophobic. Yet, we forget that our being; our existence is also defined by that vast, boundless space within. In order for the ego to even exist it needs that space within the mind to latch on to. We forget that we in fact this vast and boundless space that allows the ego to even exist. When you realize that you are bigger than your life’s most uncompromising challenges and conflicts, you realize we are a part of something bigger – conscious, instinctual energy occupying space; illuminated by celestial wisdom and energy. 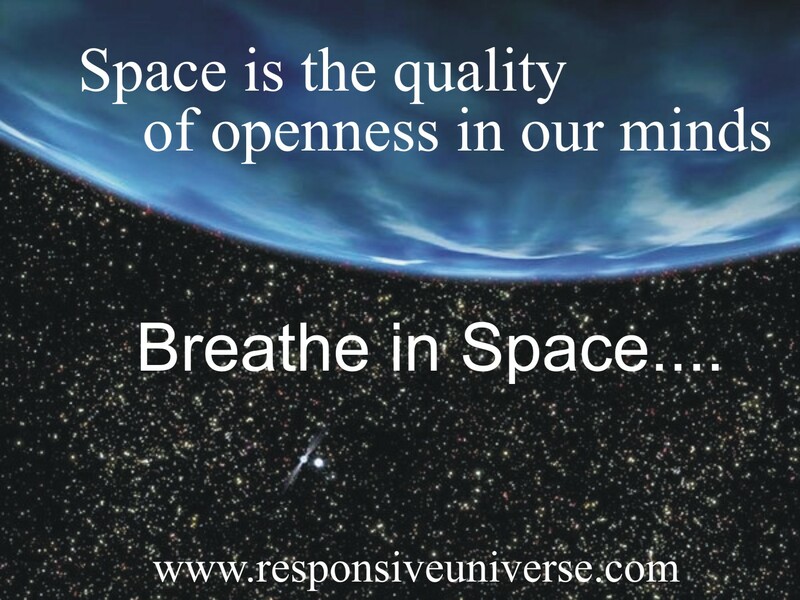 Space is the quality of openness in our minds. Physically, the brain seems small, but the mind appears to be so vast. Take the stars we see at night as an example: The bright twinkling stars we gaze upon at night are actually neighborhood stars and are just a handful of the billions of stars within our Milky Way Galaxy. Then there are billions of other galaxies within the Universe – each with billions of stars to their own; stretching across infinite reaches. The Cosmos is vast, maybe infinite. Much like the Cosmos, our mind is also vast and seemingly infinite. The idea that we can visualize and conjure up such vast numbers and distances within our mind adds to the wonderment. Look at the dream world where anything is possible and yet an undeniable facet of our mind. In fact, once you connect to your True Nature, there is a feeling that the mind and the Universe are related; perhaps symbiotic; simply different windows to the same vista. The immensity of the Universe boggles the mind, and the spacious nature of the human brain amazes and mystifies us as well. While you can measure a human brain for size and depth, when you think of the mind and all its processes and capabilities, the brain seems to defy dimensions and appears infinite. The goal is to take this space that already exists within the mind and allow it to permeate your daily life. During meditation, visualize this space within. Through mindfulness, try to settle into this space. During challenges and conflict, make space within your mind so that you do not react blindly and create bad karma. When anxiety and fear take hold, make space for such temporary things and remember that you are the space that allows the ego and negative feelings to even operate. You are so much more: Vast, boundless and intrinsic to the Universe. Feel this space as you exhale. Imagine yourself surrounded by boundless space. Look up into the night sky and marvel at all the boundless, infinite space. Look inward…. Does the mind have a fixed border? Can you pinpoint the boundary of the mind? The mind is boundless! Be this space… Settle your being into this space that exists inward and outward. Take a deep breath and exhale slowly….